You may be choosing funds for your portfolio the wrong way. Many investors overlook one of the most useful measures of a fund’s performance. The measure, called by the technical term Sharpe ratio, takes into account not just the raw returns that a fund has delivered but also how risky, or volatile, the fund has been in delivering those ­returns. Overlooking this measure can be a big mistake. Many investors think that they can handle a lot of volatility. But when steep or frequent losses occur, they feel anxious and nervous and even might bail out of the fund when its share price is down, then miss out on the rebound when the price rises again. That is no fun and leads to terrible overall results. Another reason to consider a fund’s volatility even if you can stomach risk emotionally: When you need to generate cash by selling fund shares, the more volatile your fund is, the more likely you are to have to sell shares when the price is way down. By looking at Sharpe ratios, you get a much better picture of risk-­adjusted ­performance rather than just raw ­returns. As with raw returns, higher is better with Sharpe ratios. The lower a fund’s Sharpe ratio, the less impressive its returns will look to an investor who cares a lot about volatility. The Sharpe ratio has been used by professional investors since the 1960s, when a Stanford University professor named William Sharpe—who went on to win a Nobel Prize for his economic theories—created an ingenious formula. It captured the relationship between volatility and returns in a single number. Sharpe took a fund’s returns over a given period and subtracted from that the returns you would have gotten if you instead put your money into a virtually risk-free investment—short-term US Treasuries—over the same period. He then divided that numerical result by a measure (standard deviation) of how volatile the fund had been over that period. Because this is a ratio rather than a percentage, it looks very different from the performance figures you may be used to. The higher a fund’s returns and the lower its volatility, the larger its Sharpe ratio. It’s best to check the Sharpe ratio covering at least the past five years, a period that typically is varied enough between up and down markets to judge how a fund really behaves. Over the past five years, Sharpe ­ratios have ranged from negative 3.0 to positive 2.0. A Sharpe ratio of 0.75 or higher is considered good, and 1.0 or higher indicates excellent returns for the amount of volatility the fund has exhibited. A fund might rank very differently based on its Sharpe ratio than it does based on raw returns. Example: Eventide Gilead, a mid-cap growth-stock fund, ranks in the top 9% of its category based on annualized returns of 11.2% over the five years through June 30. But risk-adjusted ­performance ­reveals something very different. The fund’s Sharpe ratio of 0.56 is just about average for mid-cap growth-stock funds. That’s because the fund has delivered a white-knuckle ride for shareholders. It experienced 50% more volatility than the Standard & Poor’s 500 stock index. In the table below, you can see the funds with the best five-year Sharpe ratios in various categories. And you can find the Sharpe ratios for other funds either at the websites of the fund companies or at investment research websites such as Google.com/finance and Morningstar.com…or at Funds.US.Reuters.com/US/overview.asp. You can compare Sharpe ratios for various funds with similar raw ­returns. Example: You are searching for multicap stock funds—that is, funds whose managers invest in companies of various sizes. You find two with annualized returns in the top 10% of the category for the past five years—Fidelity OTC (12.5%) and Mairs & ­Power Growth (12.9%). However, their Sharpe ratios reveal a stark difference. Mairs & Power has a ratio of 0.95 versus 0.70 for Fidelity OTC because it is about 25% less volatile than the Fidelity fund. You can find funds with the best risk-adjusted performance in a category and eliminate those that are too volatile for your risk tolerance. Example: You are searching for a foreign stock fund to round out your portfolio and care a lot about reducing volatility, not just maximizing performance. 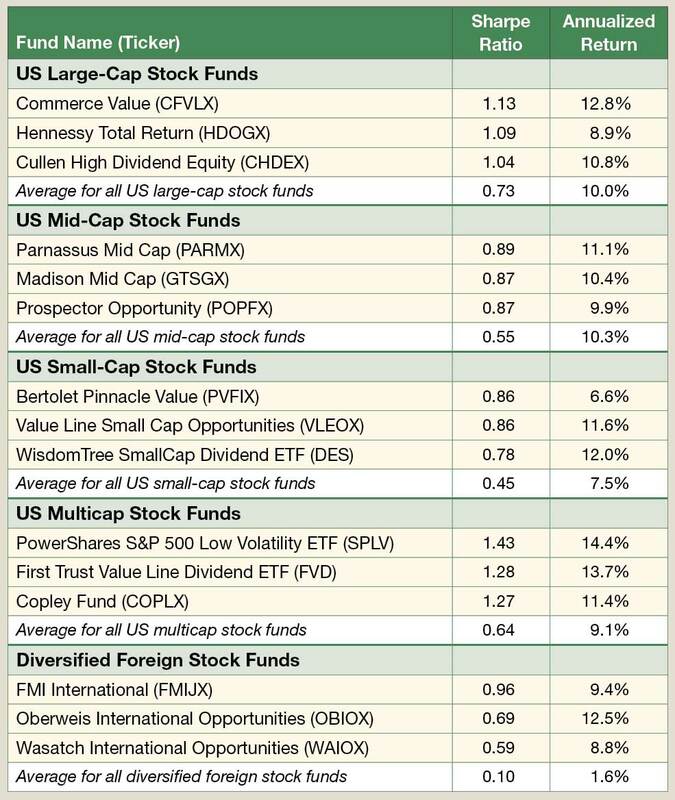 You see that FMI International has the highest five-year Sharpe ­ratio among no-load (commission-free) foreign funds (0.96), far superior to the Sharpe ratio of second-place finisher, Oberweis International Opportunities (0.69). Although the Oberweis fund’s annualized return of 12.5% is much higher than the 9.4% return of the FMI fund, the FMI fund was 45% less volatile. 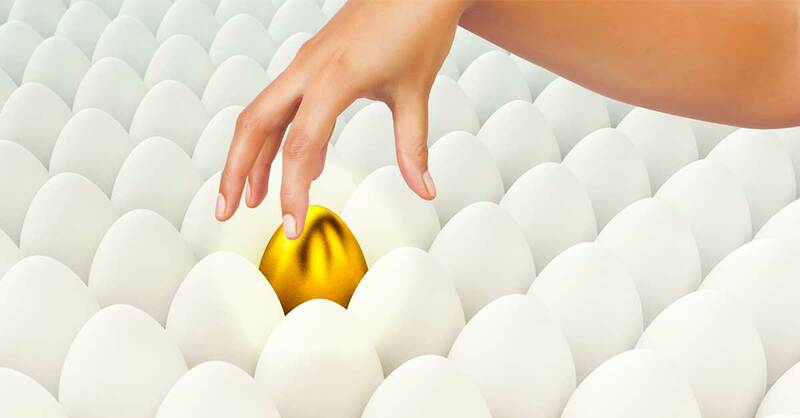 And since the FMI fund’s returns rank in the top 1% of funds in its category—still impressive—it may be the better choice for you. Caution: Keep in mind that various other factors also can be important in predicting a fund’s performance—including the fund expenses, whether the current manager has created its long-term record and whether the fund has had a consistent investment style. Here are funds that have delivered the highest returns relative to their riskiness, or volatility, over the five years through June 30, as measured by the Sharpe ratio. * Sharpe ratios typically range from –3.0 to +2.0 for that period, with numbers of 0.75 or higher very good and 1.0 or higher indicating excellent returns for the amount of risk. *Excluding funds with “loads” (sales charges or commissions), limited availability, high required minimum investments ($25,000 or more) and excluding different share classes of the same fund.